Want to do more with LinkedIn video? Looking for ideas and inspiration for your LinkedIn video marketing? In this article, you’ll discover four ways to publish LinkedIn video when you don’t know what to talk about. Have I listened to a podcast that resonated with me? Have I read a book that changed my perspective on a subject? Have I watched a video or read an article recently that I bookmarked and/or can’t stop talking about? Have I learned something new today that I can share? Curating and sharing insightful content or breaking news are fantastic ways to show you’re active in your industry. Focusing the spotlight on somebody else’s work or content also reduces the stress that comes with producing your own video content. Pro Tip: Next time you go to a conference or attend an educational event, take a minute during or after the event to shoot a quick video sharing something interesting you learned from a speaker. Make sure to tag the speaker and add the event hashtag to attract fellow attendees and event organizers. Fabio Marrama is a LinkedIn video creator who shares both original ideas and advice, as well as inspiration and lessons learned from those around him. In this video, Fabio draws inspiration from social media influencer and former monk Jay Shetty, and shares why entertainment is critical when creating content. If you find sharing a monologue on-camera intimidating, try an interview-style video. You’ll find quite a few production-style video shows on LinkedIn, created by users who focus the attention on professionals in the community who are doing interesting work. One option for your own video is to host an interview in person in a space with proper lighting and audio equipment, often the style of the popular Coffee With Kyles show, hosted by Kyle Witham and Kyle Burt. Another example of this style is the Taco Bout IT talk show created by staffing and recruiting company Advanced Resources. 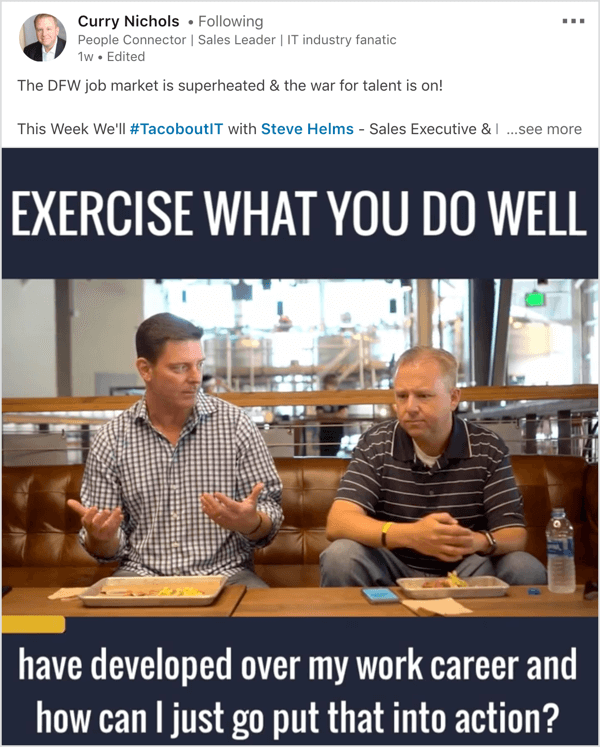 In it, Texas Managing Director Curry Nichols brings on professionals within his community to chat about various topics within the recruiting and human resources space, while eating tacos! If an in-person interview isn’t feasible, record a video call. While many video conferencing options are available, make sure you find a tool that offers meeting recording. Two popular options are Zoom, which provides free recording and meeting hosting up to 40 minutes, and Skype for Business, which is available to Office 365 Business users. An example of this style is The (Un)Learn Show, hosted by Jake Jordan, Sonny Tannan, Laci McDowell, Katie Wallace, and Chantel Soumis. In it, the co-hosts take turns asking the featured guest questions. This is an inspiring option for those who want to experiment with video, but aren’t quite ready for a full-blown one-on-one interview. Pro Tip: If you have your own podcast that serves the business community, why not share it natively on LinkedIn? Post a snippet of your podcast with a link to the full version. Lewis Howes often shares snippets and teasers for his School of Greatness podcast on LinkedIn. If you’ve published articles on LinkedIn that have garnered high engagement, you have potential content for video. For instance, an article I wrote on LinkedIn in November 2016 (“It’s Called a Life, not a Life Sentence! How to Move Forward When You Feel Stuck”) received high levels of engagement, and the content was still relevant years later. Rather than create brand-new content for a LinkedIn video, the highest referenced section of the article, which focused on job hopping, became a script for a snack-sized video. Pro Tip: If you’ve published articles but still aren’t sure which parts you should record on video, here’s an easy hack: check out the comments section of your article and look for quotes that are being shared most often. Your audience is telling you what’s resonating with them. If you use an outline or script to speak on video and record with your smartphone, consider using a teleprompter app. BigVu Teleprompter (free for iOS and Android) removes the pressure to memorize lines, and allows you to stay on topic without looking like you’re reading something off screen. When you open the mobile app, tap the compose button to open a notepad where you can write your headline and script (or copy and paste it from another document). Once you’ve typed your script, the app also shows you the duration of the video you’re about to record, which is handy if you’re trying to stay within a specific time limit. When you’re ready to record, simply tap the top-right icon, which takes you to the app’s camera. Then tap the bottom-center record button, which starts to scroll the text. Some of the coolest features of BigVu Teleprompter are the ability to adjust the reading speed to your preference and record as many takes as you like. The pro version ($9.99/monthly) also lets you brand and stylize your video before downloading it to your gallery. Many LinkedIn users become video creators by participating in trending hashtag campaigns that support causes or topics that already have a community of supporters behind them. LinkedIn frequently promotes their integrated marketing campaign for 2018, #inittogether, and asks users to share what inspires them. Participating in this campaign is simple: Turn on the camera, answer the question “What are you in it for?”, and post the video on LinkedIn with the hashtag #inittogether to show up in search results for the hashtag. #10tips10days: Share one tip daily on video for 10 days, drawing from your expertise. After you’ve completed your 10 videos, you can challenge others to do the same. #letsgethonest: One of the first video movements to go viral on LinkedIn was a call to share a challenge you’ve overcome in your career and the lessons you’ve learned from it. Once you complete your “confession,” you can tag and challenge others to get honest on camera. #myLItop10: For this campaign, you share your favorite creators on the platform, in hopes that others will be able to discover new talent to follow. #goalstogether: This is a yearly public accountability to share a video about your top goals for the year. Want to find trending video campaigns you can get involved in? Pay attention to your LinkedIn news feed. Often, a video will pop up with a specific hashtag and instructions on how to join the campaign, like the video above from Aaron Orendorff. You can also follow hashtags on LinkedIn. On the left-hand column of your news feed, find the section titled Your Communities. Then tap the pencil icon to start adding your favorite hashtags. You can pin your favorite hashtags, and you also have the option to discover more hashtags. On the Discover More page, you can see which topics are trending and how many subscribers are following each one. Checking this section frequently helps you stay on top of new LinkedIn hashtag campaigns you may want to participate in and see how many people are already following along. 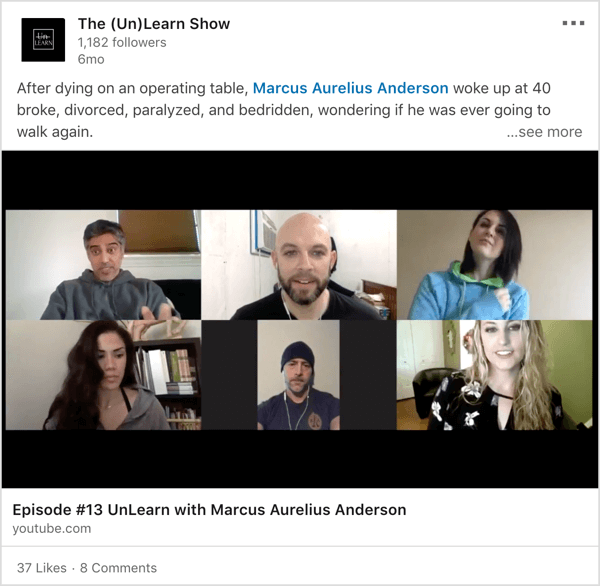 If the idea of getting on camera is making you wince or you’re struggling to nail down a topic that will resonate with your audience, there are many ways to get started with LinkedIn video. First, think about your comfort level with video. Are you more “in the moment”, or do you prefer a structured outline or script? Also, develop a video style. Want to share an inspiring lesson, monologue style, or interview others about their expertise? Do you prefer videos that are more stylized or candid/casual? Finally, get to know the LinkedIn community. Are there existing campaigns that align with your business goals? Sometimes participating in something bigger than yourself makes pressing that record button a little less scary. What do you think? What types of video do you share on LinkedIn? Have you ever participated in LinkedIn hashtag campaigns? Please share your thoughts in the comments below.